We are among the leading Manufacturers & Suppliers of Thin Film Ovens. We manufacture and supply only the best Thin Film Oven to customers. The Thin Film Ovens, we manufacture and supply, are produced using the best quality materials to safeguard our customersâ�� interest. 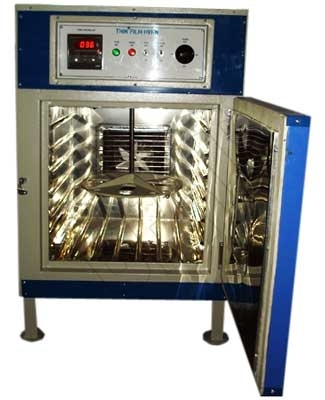 Thin Film Oven is used for rolling thin film oven tests on asphalts. It can be operated at temperature range of 5oC above ambient to 200oC. The inner chamber which is made of stainless steel with dimension of 18x18x18â��. Fitted with digital temperature controller. A geared motor to rotate the casted aluminium plate for the thin film test.